Following up on the topic, we wanted to share that it’s been a big week for WebVR! Last Friday, Oculus launched the first preview of Carmel, their own WebVR-enabled browser. 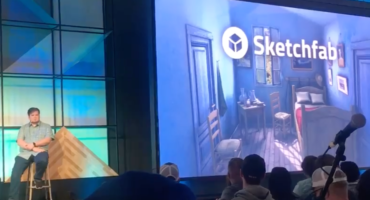 Sketchfab is featured as one of the 4 tech demos you can already explore. And on Tuesday, Google announced the release of WebVR support in the beta version of Chrome for Android. Sketchfab is one of the first domains to benefit from the origin trials (sketchfab.com has been whitelisted to have WebVR work out of the box on Sketchfab content), which means you can already give it a try. First, you’ll need to be using a Pixel phone and the latest build of Chrome beta for Android, or Canary. It works very seamlessly, just go to any Sketchfab model, and if you slide your phone in your Daydream view it will automagically open it in VR. Our full VR launcher which allows visitors to browse through Sketchfab content without leaving VR isn’t supported yet, but we are working on it. WebVR has also been available on GearVR using the Samsung Internet browser, and they keep improving their support. Side note that WebVR support is still experimental on all browsers. We are working directly with them to improve performances and navigation issues. These advances on the mobile VR front are a first step towards having WebVR fully available on standard desktop browsers, coming in Q1 2017. Exciting times for VR and the web! do I understand correctly that if I buy a Daydream it only works with a Pixel phone? If I have Daydream and a iPhone 6 or similar I will not be able to visualize any 3D model on Sketchfab, either via the app or the browser. Is this right? Daydream is an Google/Android optimised experience, this article (https://www.vrheads.com/can-i-put-iphone-google-daydream) suggests that the iPhone will work with Daydream, but in a limited fashion similar to a regular google cardboard.